At a gala evening for the local business community, web design company Treefrog Interactive Inc. was named Best Small Business by the Newmarket Chamber of Commerce. The award recognized Treefrog's innovative research and development, their contributions to the local community and the company's overall growth. Treefrog's accomplishments include the development and advancement of a variety of Internet solutions, including the LEAP™ Content Management System. The company also participates in local community events such as Bike to Work, as well as working with international charities, including Mamkhulu.org which helps children in Africa. Treefrog CEO Sean Stephens was elated with the win, bringing his staff on stage with him to receive the award. In his acceptance speech, he thanked Chamber of Commerce CEO Debra Scott and Newmarket Mayor Tony Van Bynen for their support over the years. He also encouraged the entrepreneurial spirit of growth and initiative as he raised the bar for his team's next goal. "I couldn't ask for anything more than this," he said. "At least not until we win Large Business of the Year." 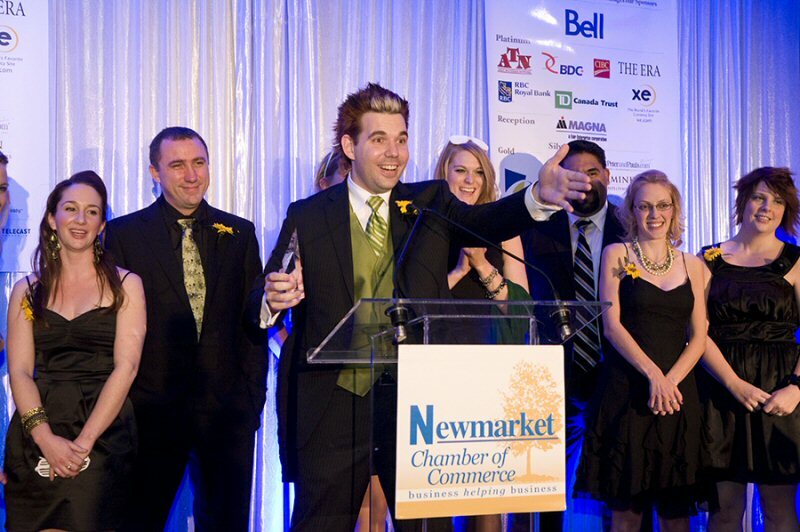 The Newmarket Chamber of Commerce hosts the Business Excellence Awards each year to recognize the innovation, progress and success in local businesses. This year's event credited the importance of local businesses with keeping Ontario moving forward during the economic turbulence in recent years. Treefrog was also the recipient of the Bell Technology Award at the 2005 gala. Treefrog Interactive has been serving Greater Toronto Area businesses for nearly 20 years, building progressive websites and online systems, as well as offering graphic design services. From consultation and design through custom programming, content development and search engine optimization, Treefrog offers its clients a full-service web design experience. Best known for their in-house Content Management System LEAP™, Treefrog Interactive Inc. is a long term web design partner, also offering Tier One website hosting and ongoing development and SEO services. ©2010 Treefrog Interactive Inc. All rights reserved. This document and the information contained herein are proprietary and confidential. It may not be duplicated, redistributed, reused, or displayed to any other party without the express written consent of Treefrog Interactive Inc.
Visit the following link to view the photo of Treefrog Interactive Inc. CEO Sean Stephens as he accepts the award for Best Small Business: http://www.marketwire.com/library/20101021-treefrogaward1021px800.jpg. About this company Treefrog Interactive Inc.
October 20, 2010 - Treefrog Interactive Inc. CEO Sean Stephens accepts the award for Best Small Business at the 2010 Newmarket Business Excellence Awards. Credit: Courtesy of The Image Commission.